Initial evaluation of the amphora assemblage indicated that it most closely resembled that from Hengistbury Head (Dorset); there is - for Britain - an exceptional number of Dressel 1 amphoras. Otherwise, the material is dominated by Dressel 20, without the diversity and range of forms one might have expected of a major settlement on the coast. The amphora assemblage had the potential therefore to shed light on the wine trade in Dressel 1 amphoras with pre-conquest Essex. The amphoras were also studied for insights into the changing status and economic standing of the settlement throughout its history. Full descriptions of the amphora types recorded at Elms Farm can be found in Part I below, Part II provides the discussion. Most amphora fabrics were identified by hand lens; occasional use was also made of a binocular microscope. Quantification is by sherd count and sherd weight, to the nearest gram. Owing to the high ratio of body sherds to rims, quantification by EVE was not carried out; instead minimum vessel numbers were estimated. The establishment of a minimum vessel count can be looked upon as a calculation of the lowest number of complete amphoras the extant sherds could represent. It is not an estimate of the actual numbers present. The minimum vessel number count was worked out for each category of amphora, with the exception of Dressel 20. The MNV counts are shown in Table 3. Further details on the recording methods used, and the research objectives, are contained in the archive. The assemblage of forty-four Dressel 1 amphoras is the largest excavated in Britain since 1945. It is only approached in scale by that from Hengistbury Head (Dorset), where thirty-eight were retrieved in the excavations of 1967 and 1979-84 (Williams 1987, 271). Nor are the Elms Farm vessels the only Dressel 1 amphoras from Heybridge. Two more rims were found unstratified with a wealth of other material at Langford Junction in 1887; one is stamped PE twice (May 1930, 243-4, nos 37-8, pl. 69, no. 343; Peacock 1971, 184; Wickenden 1986, fig. 26, nos 28-9, 58; Frere and Tomlin 1994, 15, no. 2492.45). A third rim is known from the 1997 excavations at Heybridge Hall by the Northamptonshire Archaeological Unit, just over a kilometre to the south-east. If we assume these three came from different vessels to the forty-four reported here, Heybridge has produced forty-seven Dressel 1 amphoras. Comparison with sites in Belgic Gaul (Haselgrove 1996, 171-3), on the basis of the number of amphoras per hectare, shows that Dressel 1 was less common here than there. Most of the Dressel 1 at Elms Farm arrived at the very end of the lifetime of the form over a short period of time c. 25-10 BC. This unexpected surge in wine imports suggests that special circumstances need to be invoked to account for the swift rise to prominence of the settlement. Heybridge may have become important as a settlement involved in the export of British produce to the Roman world. The ultimate destination of these exports may have been the Roman armies based in Gallia Belgica and the Rhineland, or beyond. The strain that these armies imposed on the local economies encouraged the army to seek supplies from further afield, including Britain. Eventually the adjustment of agrarian regimes in Gallia Belgica to the presence of a large standing army along the Rhine made it unnecessary to import produce from Britain; this may be connected with the apparent decline of the settlement in the Roman period. More Dressel 1 amphoras have now been recovered from Essex than from any other county in England. A fresh look at the chronology of Dressel 1 in Britain does not allow us to link the start of wine imports among the Trinovantes with the treaty arrangements in 54 BC with Caesar, although there might have been a diplomatic component to the significant quantities imported later under Augustus at settlements like Heybridge. Although nowhere in south-eastern England has Dressel 1 amphoras as early as those from Hengistbury Head, the popular view that the Gallic Wars saw a shift in the wine trade from central southern to south-eastern Britain is unjustified. The concentration of Dressel 1 in Essex throws into sharp relief their rarity in Suffolk, Norfolk and Cambridgeshire. This gap in their distribution marks out the territory of the Iceni, and the distribution of Dressel 1 allows us to fix the position of a boundary between them and their southern neighbours, the Trinovantes. Nowhere inland from Heybridge has such a large concentration of Dressel 1. But it would be wrong therefore to see Heybridge as a port of entry for Italian wine for distribution inland. Imported wine was consumed at the settlement. Seven early wine amphoras (Dressel 1 and Dressel 2-4) were retrieved from Late Iron Age pyre-related contexts. The involvement of wine at funerals confirms consumption at Heybridge itself. An assemblage of Dressel 1 amphoras from one of these pyre-related features, 15417, associated with a wealth of imported and native pottery, shows that wine was drunk in Roman style, with a meal. Examination of the amphoras from the pyre-related features shows they had been exposed to intense heat. Stacking wine amphoras around pyres is only attested in northern Europe among the Treveri of the central Moselle and it was perhaps from here that the Heybridge community acquired the practice, giving an insight into possible links between a community in Britain and a specific canton of Gaul. In the first half of the 1st century AD the volume of wine reaching the settlement fell dramatically. Over the period c. AD 10-43 imports of wine fell by up to 75% of their previous peak. This had nothing to do with a decline in settlement status; the quantities of other amphoras were maintained at existing levels or actually increased. This is part of a trend across Britain and Gaul and reflects the increased demand for wine in Italy from Augustus onwards. It finds further expression in the relative numbers of Dressel 1 and Dressel 2-4 shipwrecks, with nearly twice as many Dressel 1 shipwrecks as those with Dressel 2-4. As communities in Britain found Italian wine increasingly difficult to obtain, they turned to Catalonia in an effort to make up the deficit. Apart from Italy itself, Catalonia is the most important source of early wine amphoras at Heybridge. Declining volumes of wine reaching Britain explain why the provision of wine at elite funerals became less generous after the end of Dressel 1. There are no rich graves from the first half of the 1st century AD with as many wine amphoras as the c. 10 BC Lexden tumulus. After the Roman invasion, the tempo of amphora-borne trade slackened. The range of amphora types is limited and imports are dominated by the ubiquitous Dressel 20, the Baetican olive oil amphora. The absence of Beltrán 2 salazones suggests imports of amphoras were in decline from as early as c. AD 75. Viewed from the perspective of its amphoras, the settlement became more parochial and less international in its outlook. It is conceivable that the disruption of the Iron Age trade patterns that had sustained Heybridge before the invasion contributed to its marginalisation. The end of amphora-borne imports is indicated by the only late Roman amphora, a solitary Kapitän 2 sherd from a late 4th-century context (5768, well 5806). The excavations produced 3966 amphora sherds, weighing 273kg, from 1162 contexts. 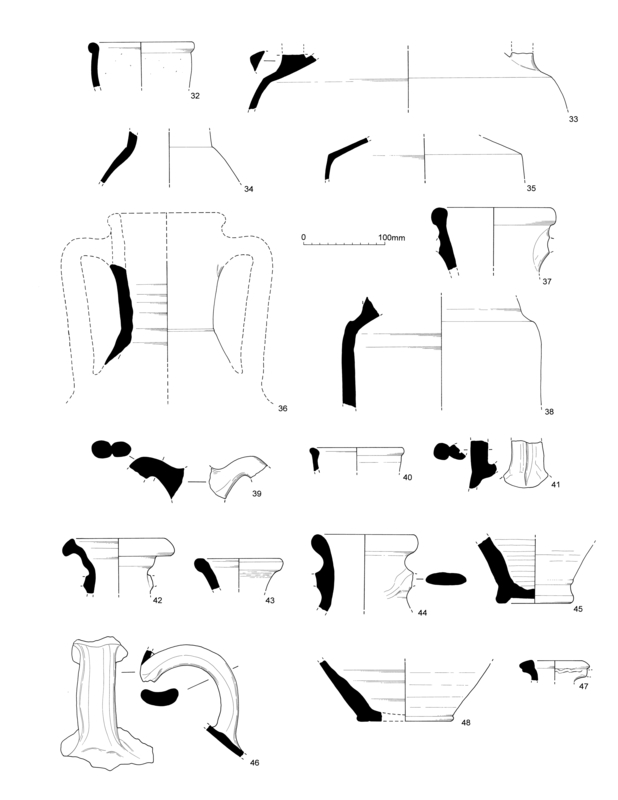 The forms present are Dressel 1, Pascual 1, Dressel 2-4, Haltern 70, Dressel 20, salazones (Beltrán 1), Kapitän 2, and three Gaulish amphora types; Gauloise 3, 4 and 6. Where it was not possible to decide if a given sherd came from Dressel 1 or 2-4, the category 'Dressel 1 or 2-4' was used; likewise there is a category 'Pascual 1 or Dressel 2-4'. Several common amphora types were not present at all, such as Rhodian amphoras of form Cam 184, carrot-shaped jars of form Cam 189 and Beltrán 2 salazones. Details of sherd counts and weights are given in Table 4. Typology and Identification: Dressel 1 amphoras at Elms Farm could be readily identified on the basis of their rims and handles (Figures 301 and 302, nos 1-28). The rims are collars with near-vertical steep sides, often with a dished outer face. Dressel 1 handles are straight (except where they bend through a right-angle to join the neck) and oval in section; a few are more rounded, and even sub-circular sections are sometimes found. One has shallow grooves or corrugations (Figure 301, no. 16), a rare feature but also found on Dressel 1 amphoras from the Jeaune-Garde A shipwreck (Carrazé 1972, 78). Handle typology varies widely from vessel to vessel, which was helpful when the minimum number of vessels was established, and as many handles as possible have been illustrated. Identical handles are found on the inelegantly named mid-Roman Campanian amphoras of the 2nd to early 4th centuries AD. In at least one instance from Britain a handle of this rare type - from Yorkshire - has been mistaken for Dressel 1 (Arthur and Williams 1992, 254). The form has been identified in Essex at Great Holts Farm, near Boreham (Williams 2003, 155). Moreover, a black sand fabric rim published from Heybridge as Dressel 2-4 can now be seen (on the basis of its typology) to be another mid-Roman Campanian vessel (Wickenden 1986, 58, fig. 26, no. 30). Technically, therefore, this newly identified amphora type could be lurking among the Elms Farm Dressel 1 handle sherds residual in later contexts, although the rarity of the type and the demonstrable prevalence here of Dressel 1 make it unlikely. Sherds from the cylindrical body of Dressel 1 are much thicker than most other forms and this massive style of fabrication is a real help when body sherds have to be distinguished from other forms. One vessel reached the quite exceptional body wall thickness of 32mm. Body sherds were taken to be Dressel 1 if they were in excess of 20mm. This approach had to be adopted to give some consistent standard for distinguishing the form from its successor, Dressel 2-4, and is, of course, an arbitrary approach, as the larger Dressel 1 body sherds occasionally demonstrated. By some vagary of throwing, one vessel had a wall that ranged in thickness from 23.5mm down to as low as 15mm. That was exceptional, but other body sherds that fell below the 20mm threshold in some places (but which could be identified as Dressel 1 because the shoulders had oval handle stubs) were a reminder of the perils inherent in assigning body sherds to a specific form on this basis alone. 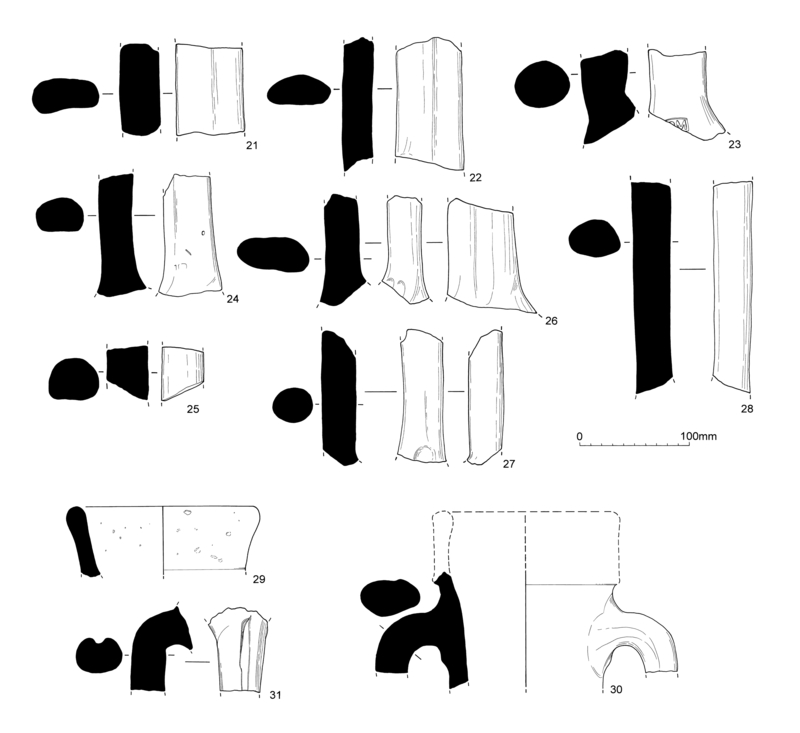 Body sherds in Italian fabrics that fell in the range of 17.5 to 19.9mm thick were therefore placed in the Dressel 1 or 2-4 category, and only body sherds 17.4mm or less in thickness were assigned to Dressel 2-4. It also proved impossible to distinguish Dressel 1 neck sherds and spikes from Dressel 2-4. There is a growing recognition that progress on the satisfactory subdivision of Dressel 1 depends on the publication of detailed measurements of selected features of each amphora. 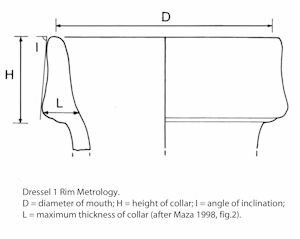 It is becoming increasingly common now (at least in French excavation reports) to give the diameter, height, thickness and angle of inclination of Dressel 1 rims. This practice is followed here (Table 5). 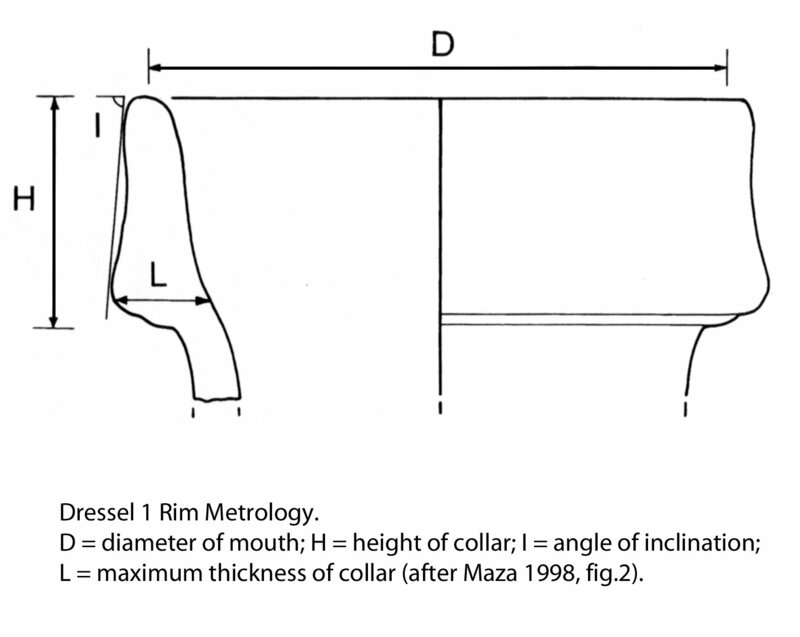 Where the rim measurements were taken is explained by Figure 300. It may eventually prove useful as well to have measurements of the two axes of handle sections, and the data for Elms Farm are given in Table 5. For the last fifteen years, there has been a lively debate on the classification of typological variants within the Dressel 1 family. There is still no satisfactory metrological scheme for defining subdivisions of the form. In view of this, the writer has followed the example of Laubenheimer (1991, 36) in her report on the Dressel 1 amphoras from the 19th-century excavations at Mont Beuvray and simply described the Elms Farm material as Dressel 1. Laubenheimer took this view because she felt that unless a specimen was complete it was pointless to try and allocate it to this or that variant. This is not to deny that we can see a typological development within Dressel 1, but no detailed scheme for Dressel 1 metrology has yet been developed to allow the allocation of excavated sherds to one or other of the traditional variants (Dressel 1a, 1b and 1c) on an objective (measurable) basis that enjoys widespread support in the scientific community. The current debate on Dressel 1 typology is outlined in the archive. Dressel 1 Stamp: Only one was found, on the base of a handle from Late Iron Age pit 21550. It reads …M (Figure 302, no. 23). Most Dressel 1 stamps are found on the rim (Henon 1995, 178); the only ones regularly found on the handle are two-letter stamps. Many are known and they form a coherent, if intriguing, element in Dressel 1 epigraphy. Enough of the preceding letter of the Elms Farm stamp survives to show that it was B, C, D, O, P, Q or R. The only two-letter stamp known to the writer ending with M preceded by one of the other letters listed above is the RM stamp, and one can be reasonably confident that the Elms Farm stamp is another example. Three sites in Gaul have produced the same stamp; Mont Beuvray (Saône-et-Loire) (three examples), Vertault (Côte-d'Or) and the oppidum of Saint-Vincent at Gaujac (Gard) (Laubenheimer 1991, 117, pl. 30, no. 147; Olmer 1999, fig. 49). The earliest two-letter stamps are apparently those on the lower ends of Dressel 1c handles on the c. 125-75 BC îlot Barthélémy shipwreck (Liou and Pomey 1985, fig. 24, nos 16 and 20, 576). In the period c. 75-50 BC they appear on Dressel 1b. A concentration of finds in the Cosa region (and their rarity in southern Italy) indicates production in southern Etruria. They do not seem to have been name stamps as such and may have played some part in the monitoring of kiln output (Olmer 1999, 81). Two-letter stamps are present on other Dressel 1 amphoras from Britain. Contents and Origin: Painted inscriptions show that Dressel 1 was a wine amphora; the contents of the form can be amplified by reference to the shipwreck evidence (Zevi 1966, 214; Sealey 1985, 23-5; Peacock and Williams 1986, 90). Discoveries of kilns, field surveys and painted inscriptions on the form show Dressel 1 was produced in western central Italy, in Campania, Latium and Etruria. Copies of Dressel 1 were made in southern Gaul, but there is no reason to think that their production and trade took place on any significant scale (Tyers 1996, 89, with refs). A Note Regarding the Black Sand Fabric (ABSAN): The source region for the familiar black sand fabric found in both Dressel 1 and Dressel 2-4 was assigned to Pompeii because some of the amphoras in the fabric were stamped by L. Eumachius, a resident of the town. He also stamped tiles there (Tchernia and Zevi 1972, 37, 40). Doubts have occasionally been raised about the exclusive attribution of the fabric to Pompeii and Herculaneum (Peña 1990, 655), especially since mid-Roman Campanian amphoras have now been identified (Williams 1994, 218). The writer has also seen the fabric in one of the Dressel 21-22 amphoras from Colchester (Symonds and Wade 1999, fig. 3.2, no. 36). Full discussion of the black sand fabric 'problem' is contained in the archive. There is a real possibility that at least half the black sand fabric amphoras reaching Britain are not from the Bay of Naples but from sources elsewhere in Italy. It would seem that these lie somewhere in southern Etruria or Latium (Peña 1990, 655). At Elms Farm the fabric is well represented in both Dressel 1 and 2-4. Date: As a form, Dressel 1 was produced from c. 150 BC to c. 10 BC and the transition to Dressel 1b took place during the middle of the 1st century BC. Dressel 1b is the most common variant in the south-east, indicating its initial arrival after the mid-1st century BC. It is clear, however, that Dressel 1 reached Heybridge over a brief period at the very end of the history of the form. Doubts have been raised about the validity of 10 BC as the terminal date for Dressel 1; these reservations and their implications are discussed in the archive. The Elms Farm data should dispel any lingering doubts, in that they show that exports of the form could remain locally significant in northern Europe until the advent of Gallo-Belgic wares c. 15 BC. Dressel 1 at Elms Farm: Only a single Dressel 1 sherd weighing 314g was present in Ceramic Phase 1 (c. 50-15 BC). No less than 99.9% by sherd count and 99.5% by sherd weight of the Dressel 1 amphoras recorded in the Ceramic Phase dataset came from contexts later than c. 15 BC, with most in Ceramic Phase 2 (c. 15 BC-AD 20). To some extent the statistics have been distorted by the weight of Dressel 1 in the c. 10 BC-AD 5 pyre-debris pit 15417 (Group 33), but that still leaves 11.428kg of Dressel 1 in Ceramic Phase 2. Although some of these will be residual from the preceding phase, the inescapable conclusion is that the Dressel 1 amphoras reached the settlement over a few years at the very end of the life of the form, let us say c. 25-10 BC. 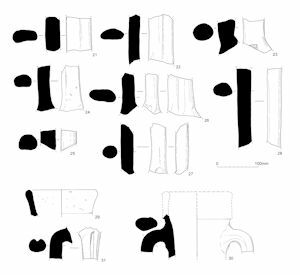 Typology and Identification: Catalan amphoras can be identified in the first instance on the basis of their two distinctive fabrics, a red (ARCAT) and a white (AWCAT) Pascual 1 is a local copy of the Italian Dressel 1. A collar rim is common to both forms. With Pascual 1 it tends to be tall and vertical, or steeply inclined. The oval handles of Pascual 1 are likewise distinctive; sometimes a narrow groove runs down the outer face ( Figure 302, nos 29-31). Since Catalan Dressel 2-4 is also present, there is the problem of distinguishing body sherds of the two forms. It was decided to follow the same procedure for distinguishing Dressel 1 from Dressel 2-4. Vessels with body wall sherds thicker than 20mm were taken to be Pascual 1. Any body sherd less than 17.4mm was regarded as Dressel 2-4, and sherds in the range 17.5-19.9mm were treated as Pascual 1 or Dressel 2-4. Contents and Origin: There are no painted inscriptions on the form specifying contents but it is widely and rightly assumed to have held the same wines that were bottled in Dressel 2-4 amphoras from Catalonia (Sealey 1985, 45-6, with refs). Since that was written, more light on the contents of Catalan amphoras has come from a painted inscription on a Dressel 2-4 from the region, specifying Aminnean wine as the contents. This was a wine named after the parent grape variety, rather than the place of origin (Liou 1993, fig. 2, 135, no. 8). Kiln sites in the region leave no room for doubt about the origin of the form (Pascual Guasch 1977; Keay and Jones 1982). Date: One of the earliest examples comes from a context dated c. 55-40 BC in southern Gaul (Tchernia 1986, 143). Another specimen was found on the c. 50 BC 'Dramont A' shipwreck (Parker 1992, 165-6). At first exports seem to have been modest, to judge by the Cybele sanctuary site at Lyons, where the form only accounted for 4% of the amphoras in a context dated c. 40-20 BC (Lemaître et al. 1998, 51, fig. 8, nos 6-10; Desbat 1999 for more details of the site and its chronology). Production continued for some time after the end of Dressel 1 c. 10 BC. In Gaul the form is found associated with structures not built until Tiberius (Baudoux 1996, 40), but its absence from sites in Britain founded after AD 43 shows production had stopped by then. At present c. AD 25 is the best estimate of its terminal date (Martin-Kilcher 1994, 335). Pascual 1 at Elms Farm: There is a minimum of four Pascual 1 from the settlement. Imports started in Ceramic Phase 2 (c. 15 BC-AD 20), peaking in Ceramic Phase 3 (c. AD 20-55). An increase in the number reaching the settlement after the end of Dresssel 1 is implied, presumably to compensate for dwindling exports of wine from Italy, as demand there rose under Augustus and his successors. Three of the Elms Farm Pascual 1 are in the red and one in the white fabric. Its presence at Heybridge gives definition to a strand in the Iron Age exchange networks of the Trinovantes that has hitherto lacked focus. An unstratified Catalan handle from the Sheepen site at Colchester is one example (Sealey 1985, 102). An old and meagrely documented find of a Pascual 1 handle from Thaxted (apparently associated with Dressel 1) is another (Rodwell 1977, 251; Williams 1981, 130). A third Pascual 1 is suspected from a 20mm thick Catalan body sherd in a Late Iron Age pit at Slough House Farm, not far from Heybridge itself (Horsley and Wallace 1998, 143). These Essex finds are the only Pascual 1 amphoras from the south-east; most examples from Britain come from central southern England (Fitzpatrick 1985, 320). Typology and Identification: The handles are bifid (figure-of-eight) in section and unique to the form. Sometimes, such handles are formed from two separate rods of clay which were luted together. These can come adrift but there will usually be a scar to indicate the presence of the second joining rod. On other handles, the figure-of-eight section is formed by making a groove on one or both of the sides of an otherwise oval handle. Simple bead rims are not confined to Dressel 2-4 and are not in themselves therefore diagnostic of the form. Confusion with Cam 184 amphora is possible but as there are no fabrics shared between both forms, familiarity with Cam 184 fabrics should lead to the isolation of Dressel 2-4 rims. The junction between the shoulder and body is always sharp and clearly defined, and sherds from that part of a Dressel 2-4 amphora should usually be recognised for what they are. Ten of the Dressel 2-4 from Elms Farm are illustrated (Figure 303, nos 32-41). One of the reasons why Dressel 2-4 replaced Dressel 1 in Italy was its greater efficiency as a mode of trade packaging. The thick walls of Dressel 1 made it a heavy container and the potters who made its replacement went to the other extreme and produced a form with thin and fragile walls. The economic advantages are immediately obvious because Dressel 2-4 has a more favourable ratio of empty weight to filled weight (Hesnard 1977, 161-4; Tchernia 1986, 135). The cylindrical body form of Dressel 2-4 is much the same as Dressel 1 with significantly thinner walls. The thicknesses of Dressel 2-4 body sherds at Elms Farm have been fully recorded and a random selection shows dimensions of 8, 8.5, 9.5, 10, 10.25, 11, 11.25, 11.5, 12, 12.75, 13, 14.25, 15.25, 15.5 and 17mm. This gives a flavour of the size of the sherds and the range of thicknesses present. The difference between the robust walls of Dressel 1 and the fragile Dressel 2-4 is striking. As with the identification of Dressel 1 sherds, a specific figure had to be selected as diagnostic to make sure that the recording was consistent. The writer decided to identify wall sherds thinner than 17.4mm as Dressel 2-4. Vessels with wall sherds in the range 17.5 to 19.9mm thick were placed in an indeterminate Dressel 1 or 2-4 category, and anything in excess of 20mm was treated as Dressel 1. Contents and Origin: Painted inscriptions on Dressel 2-4 show the form was a wine amphora (Zevi 1966, 215-16) but occasionally other contents are indicated (Sealey 1985, 46-7). A Dressel 2-4 from the King Harry Lane cemetery at Verulamium, Hertfordshire, had been bottled with olive oil (Evans 1989). Dressel 2-4 amphoras were modelled on prototypes from the Greek island of Kos. Production in Italy and the western provinces was widespread; evidence for the manufacture of the form has been forthcoming from Gaul, western Switzerland, Baetica and Catalonia in Spain, and even Britain (Tyers 1996, 90, with refs). Progress is being made on the definition of provincial versions. The distinctive fabric of Catalan Dressel 2-4 allows the identification of one of the major suppliers of the form. The distinctive typology of specimens made at Fréjus (Var) and other sites in the south of France has allowed their recognition elsewhere, notably at London (Laubenheimer et al. 1991, figs 11-12, 250-2, 257-9; 1992). Fabric and typology also make it possible to recognise those Dressel 2-4 made in Britain at the Verulamium region potteries (Symonds and Wade 1999, 162) until at least later in the 1st century AD (Castle 1978, 391). Date: The form was made in Italy as early as the Madrague de Giens shipwreck of c. 75-60 BC (Hesnard 1977, 159, 162, 167, fig. 4; Liou and Pomey 1985, 564, for the date of the wreck). Elsewhere in the West, provincial versions are not found until Augustus. In the important amphora deposit from the House of the Porch at Ostia dated c. 50-25 BC, Dressel 1 amphoras outnumber Dressel 2-4 by twenty-one to two vessels (van der Werff 1986, 119) and it would seem that Dressel 2-4 was not widely produced in Italy until the last quarter of the 1st century BC. Production of the form in the peninsula lasted much longer than had previously been realised. Some potteries were still making the form there as late as the early 3rd century AD (Freed 1989). Export of Italian Dressel 2-4 that late has emerged from the study of two large dumps of these vessels from late 2nd to early 3rd century AD warehouses at Saint-Romain-en-Gal (Rhône) (Desbat et al. 1990). Indeed Italian Dressel 2-4 seems to have outlasted all the other western versions of the form. But although the form had a long history, its floruit came in the last decades BC and in the 1st century AD. Dressel 2-4 at Elms Farm: Using sherd count and sherd weight for the incidence of Dressel 2-4 in the amphora assemblage as a whole gives figures of only 6% and 3% respectively. Yet quantification by minimum vessel number count indicates the presence of at least twenty-seven vessels. The generally lighter construction of the form compared to Dressel 1 and Dressel 20 in particular means Dressel 2-4 data expressed in terms of sherd count and sherd weight seriously under-represent their importance. This is a valid comment on the quantification of amphora data. Dressel 2-4 was present in Ceramic Phase 1 (c. 50-15 BC) and imports continued until Ceramic Phase 5 (c. AD 80-125). None at all is recorded for the next Ceramic Phase and all subsequent sherds may well be residual. At first sight, the sherd count and sherd weight data suggest that imports of the form were at their height in Ceramic Phase 3 but this masks a far more interesting picture in which wine imports to Heybridge actually declined dramatically in that period. Table 7 gives the allocation of minimum vessel numbers to the fabrics present. It shows that just over half are Italian (55.5%), and a third (29.6%) is Catalan. The remaining four vessels in four different fabrics could not be assigned to a source. The fourteen shipwrecks with Catalan Dressel 2-4 reviewed by Corsi-Sciallano and Liou all fall within a half century or so of each other down to Nero and point to a vigorous but short-lived economic current, one in which Heybridge participated. Exports of wine from Tarraconensis were in decline in the second half of the 1st century AD (Corsi-Sciallano and Liou 1985, 171-2). Typology and Identification: The Gaulish amphoras discussed here are the extensive series with foot-ring bases defined by Laubenheimer (1985). Versions of Spanish and Italian amphoras made in Gaul are not present at Elms Farm. Seven of the nine recorded Gaulish amphoras are Gauloise 4, the standard form (Figure 303, nos 43-6). It has short flexed handles, with a shallow central groove. Rims are round and thick; this and most other forms have a narrow flat base with foot-ring. Gaulish amphoras are relatively modest in size and thin-walled; sometimes body sherds of Gauloise 4 have horizontal fluting. As the body tapers from a broad shoulder towards a more-or-less narrow base, the configuration of larger body sherds can often help in the recognition of examples. Two of the Gaulish amphoras are Gauloise 3 and 6. The former was recognised at Elms Farm from the rounded rim with moulded neck below (Figure 303, no. 42); a similar rim is present at London (Davies et al. 1994, fig. 12, no. 33). Gauloise 6 has a distinctive furrowed rim and is the only Gaulish amphora that occasionally has a flat (as opposed to foot-ring) base (Figure 303, nos 47-8). Contents and origin: Painted inscriptions on Gaulish amphoras show the contents were wine. Resinated wines are indicated by the inscriptions mentioning picat(um); sometimes they are specified as mature (vetus). Honey wine (mulsum) and the sweet wine called passum made from dried grapes (raisins) are both also attested by inscriptions. No less than fourteen inscriptions record aminneum, wine made from the aminneum grape. Gaulish amphoras are securely assigned to the southern province of Gallia Narbonensis on the basis of the many kiln sites reported; sporadic production took place further north (Laubenheimer 1985). Date: There are only three painted inscriptions with consular dates on Gaulish amphoras. A Gauloise 7 made (and excavated) at Fréjus (Var) bears the date AD 28 (Liou 1991). An unspecified Gaulish amphora from Fos-sur-Mer (Bouches-du-Rhône) was bottled with its contents in one of the years when Vespasian and Titus were consuls, possibly AD 74. A Gauloise 4 from the same place bears another Flavian date, AD 79 (Liou 1987, 70, 72, fig. 9). The poverty of painted inscription dates has made our knowledge of the chronology of the various Gaulish amphoras reliant on excavated land finds, with all of the attendant imprecision; the terminal date of Gauloise 4 is particularly difficult to establish. Anyhow, it is clear that Gauloise 4 had emerged by the middle of the 1st century AD (Baudoux 1996, 56) and that it remained current until the 3rd century AD (Martin-Kilcher 1994, 361). Our understanding of the chronology of the two other (rare) Gaulish forms present at Elms Farm is woefully inadequate. It would seem that Gauloise 3 appears in the first half of the 1st century AD and that Gauloise 6 belongs to the same century (Laubenheimer 1985, 385-6). A very similar Gauloise 3 rim to ours has been published from the major 2nd-century AD workshop at Thésé-Pouillé (Loir-et-Cher) (Laubenheimer 1989, 114, fig. 10, no. 3). Gaulish Amphoras at Elms Farm: Gauloise 4 and related types are among the more common amphoras from Roman Britain (Peacock 1978, 49) but at Elms Farm they make a poor showing, with a minimum of only nine vessels. This is further evidence for the dwindling fortunes of the settlement after its auspicious start as a major consumer of Mediterranean produce in the Late Iron Age. Imports of Gaulish amphoras were flagging by Ceramic Phase 5 (c. AD 80-125). This is borne out by the dearth of material in Ceramic Phase 6 (c. AD 125-170). Later material (despite its quantity) may well be largely residual. Gauloise 4 was present in Ceramic Phase 3 (c. AD 20-55) contexts. Consideration was given to the possibility that the sherds in question were Iron Age arrivals, and that the form present was not in fact Gauloise 4. It weighed heavily with the writer that Gaulish amphora body sherds were present in small quantities at Late Iron Age Silchester, but where the precise form could not be identified (Williams 2000, 221, 224; Fulford and Timby 2000, 295). Examination in detail of the contexts of the Ceramic Phase 3 Gaulish amphoras showed them to lie at the end of the phase. There were no Iron Age imports of Gaulish wine at Elms Farm, and the identity of the sherds as Gauloise 4 is not in doubt. It is, of course, interesting that Gauloise 4 was present from as early as the middle of the 1st century AD, although one notes that the form was also present at London in pre-Boudican contexts of the 50s AD (Davies et al. 1994, 18). Elsewhere it apparently does not become securely established until the Flavians. 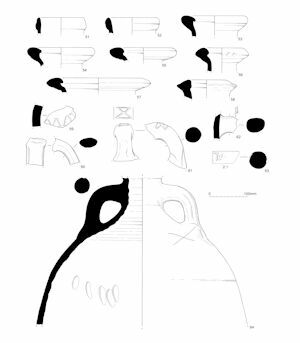 Typology and Identification: The form was identified on the basis of a neck sherd with horizontal furrowing and a handle with oval section rising from the upper end of the neck (Figure 306, no. 73). It is clear from both sherds that the parent vessel was of only diminutive size, and that settled the identification. The type takes its name from some of the cargo amphoras on board the c. AD 215-30 'Ognina A' shipwreck at Syracuse (Kapitän 1972, 246, 248; Parker 1992, 292). Contents and Origins: The contents of the type remain unknown, although the modest capacities of these jars suggest wine. Distribution of the form and its typology suggest an origin in the Aegean region (Riley 1979, 189-93; Parker 1992, fig. 13). Fabric analysis shows that several different areas were involved in production of the form. The same analyses rule out an origin on Rhodes; a conclusion corroborated by field surveys on the island that failed to find the form at any of the amphora workshops located there (Empereur and Picon 1989, 233). A kiln has been reported from Ephesus on the Aegean coast of Asia Minor and there is circumstantial evidence that the contents included Maeonian wine from the adjacent province of Lydia. The price edict issued by Diocletian mentions Maeonian caroenum, a non-alcoholic syrup like defrutum and sapa made by boiling down grape must (Peña 1999, 84, citing Edictum de Pretiis 2.13). Date: The form has been reported from late 2nd century AD contexts at Ostia and Rome, but not apparently elsewhere. The floruit of Kapitän 2 amphoras fell in the later 3rd and 4th centuries AD (Riley 1979, 190). Output declined in the 4th century; at Rome sherds of the form after c. AD 325 look residual, at least on the Palatine Hill. Production seems not to have continued beyond the end of the century (Panella 1973, 596-7; Riley 1979, 190-1; Martin-Kilcher 1994, 440; Peña 1999, 84). Kapitän 2 at Elms Farm: The type is represented by only two sherds (from the same vessel), in a context (5768) dated c. AD 360/70-400+; the sherds need not be residual. Kapitän 2 is the only late Roman amphora type from Elms Farm and it marks the end of a trade in Mediterranean amphoras extending back over three hundred years. The type is uncommon in Britain, but with a concentration (if that is not too strong a word) on both sides of the Thames estuary (Tyers 1996, 102). Typology and Identification: The distinctive fabric is shared with Dressel 20 (see below). Small body sherds of both forms are indistinguishable and there must be more Haltern 70 sherds concealed in the data for Dressel 20. Only six sherds could be definitely identified as Haltern 70. They include a neck with the stub of a handle with exterior groove and a length of flexed handle from a second vessel with the same style of groove (Figure 304, nos 49-50). Contents and Origin: The contents of the form were defrutum and sapa, and olives preserved in defrutum. The congruence of the fabric with Dressel 20 shows that Haltern 70 came from the same regions of Baetica in Roman Spain (see below). Copies of the form were made in the Rhône valley (Martin-Kilcher 1994, 391-2, with refs) and these copies reached Britain. Some time ago the writer published what he took to be a Haltern 70 from the Sheepen site at Colchester (Sealey 1985, fig. 8, no. 71). But its fabric is fine with a rough-cast outer surface; the basal spike is not solid throughout but has a depression at the top. Dr S. Martin-Kilcher later established that it was in fact a Gaulish vessel, and not Baetican. None of the Elms Farm Haltern 70 is Gaulish. Date: The earliest Haltern 70 remains an unillustrated neck sherd from the c. 75-60 BC Madrague de Giens shipwreck (Tchernia 1980, 306; 1986, 142; Liou and Pomey 1985, 563). One wonders how a solitary Spanish amphora came to be on board a vessel bound from Italy at this early date. There is a rim from a context dated c. 40 BC at Lyon (Lemaître et al. 1998, 50-1, fig. 8, no. 11). Although the floruit of the form did not range beyond Nero (Baudoux 1996, 46), it was still current under the Flavians (van der Werff 1986, 356, 368) and - much changed typologically - into the 2nd century (Martin-Kilcher 1994, 388). Late variants of the type from London are (to my eye at least) sufficiently far removed from the true Haltern 70 to merit classification as a separate form (Davies et al. 1994, 11) called by the writer Ver. 1908 amphoras, after a rim from Verulamium (Wilson 1984, fig. 80, no. 1908, 202). Haltern 70 at Elms Farm: The six Haltern 70 sherds, nearly all residual, represent a minimum of two vessels. Both of the illustrated handles are unstratified. It is likely that Haltern 70 must have reached Heybridge in the Iron Age but there is no evidence to prove this. A more-or-less complete specimen found nearby in the 19th century at Bouchernes Farm may have come from a rich cremation grave (Wickenden 1986, fig. 26, no. 15, 55). Typology and Identification: The most common amphora type in Britain is also the easiest to identify. The sandy buff fabric is unmistakable and shared only by Haltern 70 and a very few salazon amphoras (Davies et al. 1994, 14). The globular form of Dressel 20 allows the recognition of otherwise featureless body sherds. The flexed handles with their round sections are distinctive; so too are the rims with their short and rounded profiles, eventually becoming angular towards the end of the life of the form. It was decided to assign all sherds in this fabric to Dressel 20, unless there was unequivocal typological evidence to suggest otherwise. In practice this means that the only other type in this fabric definitely attested (Haltern 70) is probably under-represented in the sherd count and sherd weight database. Only two (incomplete) stamps were recovered and three pre-firing graffiti (Figure 305, nos 59, 61-64). Contents and Origin: Dressel 20 was used for the transport of olive oil. The form was produced in Baetica along the River Guadalquivir between Seville and Corduba, and along the lower reaches of its navigable tributaries (Martin-Kilcher 1987, 4, 9-58; Carreras Monfort and Funari 1998, 5-12). Date: The first sign of Dressel 20 in northern Europe comes from a fortified site on the right bank of the river Somme at La Chaussée-Tirancourt occupied c. 50-15BC. A handle was recovered from a post-hole there; all the other amphoras were Dressel 1 (Fichtl 1995, 142, fig.17). Production of the form continued until the third quarter of the 3rd century AD when it evolved into the successor form, Dressel 23 (Carreras Monfort and Funari 1998, 13, with refs). Dressel 20 rims can be dated on the basis of their typology by reference to the indispensable charts published by Martin-Kilcher (1987, Beilagen 1-2). Table 8 gives details of the dates of the illustrated rims from Elms Farm, along with the dates that can be assigned to them on the basis of these charts. Carreras Monfort and Keay (1996, 438) have questioned the validity of the Martin-Kilcher scheme on the basis of the Cala Culip D wreck, with its cargo of Dressel 20 amphoras that sank in the reign of Vespasian (Izquierdo Tugas 1989; Nieto Prieto 1989), but this exaggerates the typological range present among the rim forms and overlooks that the poorly fitting stoppers suggest at least some of the amphoras were old vessels that had been reused. Dressel 20 at Elms Farm: The form was the most common single amphora type, accounting for 44.5% of the amphoras by sherd count and 48.8% by sherd weight. Amphora assemblages from Britain are usually dominated by this form. On military sites in northern Britain, the proportion of Dressel 20 sherds is positively overwhelming (Bidwell and Speak 1994, 214). Indeed after Dressel 1, Dressel 20 is the most common amphora type in the whole of the western Roman world. The sheer quantity of Dressel 20 sherds at Elms Farm ruled out any possibility of attempting a minimum vessel number count. Sherds of the form are present in Iron Age contexts from Ceramic Phase 2 (c. 15 BC-AD 20) onwards. Two rims can be recognised as pre-Claudian arrivals on the basis of their typology, as can a small handle with oval section (Figure 305, nos 51-2, 60). Dressel 20 is uncommon on Iron Age sites in Britain (Williams and Peacock 1983, 266-7). From soon after the Roman invasion, Dressel 20 is the only amphora form reaching the settlement in any quantity. After c. AD 125 the only amphoras reaching Heybridge other than Dressel 20 are a few Gauloise 4 and a single Kapitän 2. Imports peaked in Ceramic Phase 6 (c. AD 125-170). This is a pattern typical of Britain as a whole (Williams and Peacock 1983, 268) with the notable exception of London, where there was a slackening of Dressel 20 imports under Hadrian and in the early Antonine period (Davies et al. 1994, 9). In the 2nd century at Elms Farm half a Dressel 20 amphora had been buried upside down in pit 4582 (Group 731) (Figure 305, no. 64). The vessel is assigned to that century on the basis of its small handles that approach the neck horizontally (Martin-Kilcher 1987,, abb. 28, no. 4; Carreras Monfort and Funari 1998, fig. 75). An unresolved problem for Dressel 20 in Britain is the secure identification of its rare successor form, Dressel 23 (Carreras Monfort and Funari 1998, 13). It was certainly present at Heybridge because the body of a specimen found in 1875 at Boucherne's Farm, and used as a cremation urn, has already been published (Wickenden 1986, 55, fig. 26, no. 19). At Elms Farm, some of the Dressel 20 sherds from later contexts were conspicuous for their thin walls and generally smaller build. There were differences in the fabrics as well, with sherds having a tendency towards a finer paste with a red finish. 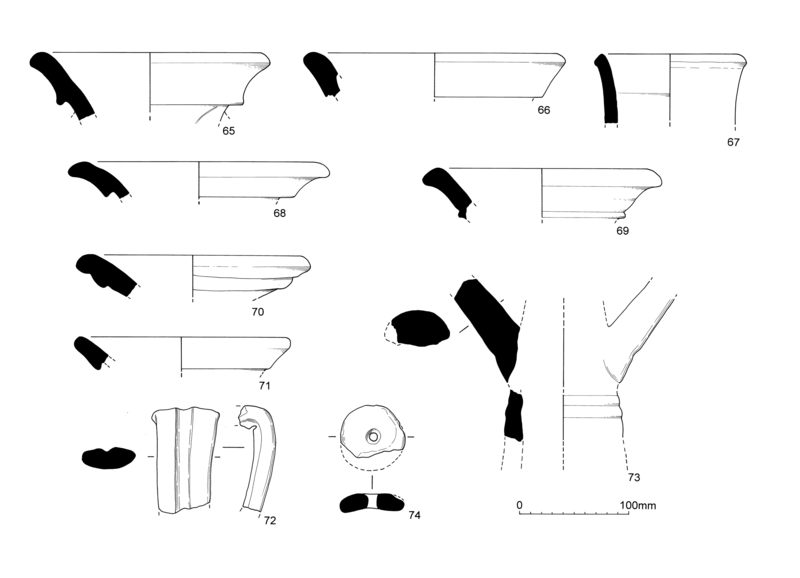 In the absence of diagnostic typological features it is impossible to decide to what extent these sherds include a Dressel 23 component; for Britain the problem is easier to pose than to solve (Williams and Carreras Monfort 1995, 236-7). Exports of Baetican olive oil to Britain in Dressel 20 and Dressel 23 amphoras have been surveyed in extenso by Funari (1996) and Carreras Monfort and Funari (1998). Both have laid emphasis on the concentrations of Dressel 20 on military sites and the role of the state in provisioning garrisons with olive oil. Civilian and native Heybridge is a reminder that this was not the whole story for olive oil consumption in Roman Britain. Typology and Identification: The rims are distinctive and should seldom cause confusion. At Elms Farm, the most common single rim form is a wide, flared, trumpet-shaped mouth with a carefully moulded collar and a concave outer face; the lower edge is usually undercut (Figure 306, nos 65-71). The funnel-shaped rim is unusual, so too is a rounded and chunky rim with exterior groove (Figure 306, nos 67 and 70, respectively). Handles are flattened oval in section, sometimes with an outer groove, tapering from top to bottom (Figure 306, no. 72). Even sherds from the junction of neck and body can be diagnostic of form because the body often falls away from the neck without any shoulder feature at all. The construction generally is on the sturdy side; it is not unusual to find body wall sherds 20mm or more in thickness. The only salazon form definitely attested is Beltrán 1, which is essentially Dressel 7-11. There is no hint whatsoever of the later hooked rim of Beltrán 2a. Salazon studies nowadays try and relate vessels to specific Dressel form numbers for his types 7-11. At La Longarina, Hesnard (1980, 147) was even able to define two new types within the broad church of Beltrán 1. Results have been encouraging and, when applied to the Elms Farm material, a Dressel 8 rim (Figure 306, no. 69), and two Dressel 9 rims (Figure 306, nos 68 and 71) can be recognised. The former has a sub-rectangular cordon at the base of the rim; the latter has a wide rim with a flared trumpet mouth undercut at the collar base, and with a concave outer face. Confusion with other, very similar, Beltrán 1 rims is possible; the main difference is that their collar rims are deeper and less emphatically flared than Dressel 9. Contents and Origin: Salazones (the word is Spanish, in French salaisons) is a generic term for amphoras bottled with high salt-content fish sauces (garum, muria and alec) and salted fish. The number of painted inscriptions with evidence for contents continues to grow and confirms the primacy of marine products as the contents of the form. The Baetican origin of Beltrán 1 is clear; imitations of the form made elsewhere are of uncertain significance (Tyers 1996, 99, with refs). One of the main sources of supply to Britain was apparently the Cadiz region (Peacock 1974, 241-2). The large red iron ore particles diagnostic of Cadiz are certainly present among the Elms Farm material, but it proved impossible to satisfactorily quantify its incidence. Even a large sherd might have only a solitary iron ore particle and so their absence from smaller sherds could not be taken as proof that the parent vessel was not a Cadiz product. Three illustrated rims have iron ore inclusions (Figure 306, nos 65, 69 and 70). Date: The earliest find of a Baetican salazon is the Dressel 9 from Clemency (Luxembourg). There a rim and body sherds were securely stratified with Dressel 1 amphoras in the north-east of the c. 80-60 BC funerary enclosure. The excavators were understandably surprised at its presence, but the vessel was not intrusive (Metzler et al. 1991, fig. 61, no. 1, 78). Dressel 9 was present in the c. 40 BC Horizon I at the sanctuary of Cybele in Lyon. In the later c. 40-20 BC Horizon II, Beltrán 1 and 3 salazones rise to 19.5%, by minimum vessel number count, from the 6% of the preceding phase; to judge by the illustrated rims, Dressel 9 is again the dominant form (Lemaître et al. 1998, 50-1, fig. 9). Martin-Kilcher (1994, 562-3) cites early salazon amphoras from contexts dated c. 30 BC at Geneva and Besançon. The most important evidence for the early export of salazones from Baetica is the c. 50 BC Titan shipwreck, with its cargo of Dressel 12 (Beltrán 3) amphoras (Tailliez 1961, figs 1 and 4, 185, 197; Parker 1992, 424-5), and the c. 50-30 BC wreck of Cap Béar C, where the bulk of the cargo was Dressel 1, Pascual 1 and Dressel 12 (Parker 1992, 97-8). But Dressel 12 has not yet been reported from Britain and the earliest salazones here are invariably Dressel 9. This was emphasised by Peacock (1981, 202) in his study of the Skeleton Green, Hertfordshire, material, where two such rims were present. The form disappeared after Augustus (Baudoux 1996, 70) and in Britain it was always an Iron Age arrival, like Dressel 1. It was not present in the legionary fortress and colonia at Colchester (Symonds and Wade 1999). Views differ on the terminal date of Beltrán 1. Panella (1973, 508) felt that Dressel forms 7-13 were too common in Flavian contexts at Ostia to be explained as residual material. A more conservative assessment comes from Martin-Kilcher (1994, 399) who was reluctant to envisage production of the form much beyond c. AD 50. Beltrán 1 was probably replaced by Beltrán 2 in the decades AD 60-80, by - let us say - c. AD 75 (Sealey 1985, 84). The last definite shipwreck with the form is Ses Salines, where it shared the hold with Dressel 20 amphoras. Stamped lead ingots show the ship sank in the reign of Vespasian (Parker 1992, 378-9). Salazones at Elms Farm: The minimum vessel number count of salazones at Elms Farm is eleven. 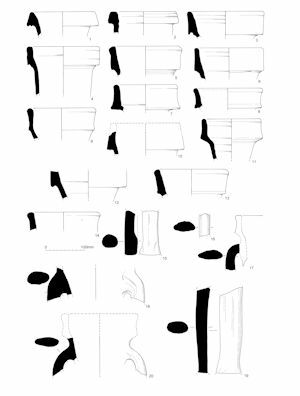 No less than seven of these have rim sherds; all are illustrated (Figure 306, nos 65-71). All of them are the early salazon form, Beltrán 1. Imports peaked under Augustus in Ceramic Phase 2 (c. 15 BC-AD 20). They continued until the Roman invasion, but numbers fell away in Ceramic Phase 4 (c. 55-80 AD). An early end to salazones at Elms Farm explains the absence of the later hooked rim form, Beltrán 2a. Sherds from nine terracotta bungs were recovered at Elms Farm. The edges are generally thick and the profiles slightly dished. None was complete and the diameters had to be reconstructed from tiny portions of the edges. Only one had no original edge to give a diameter measurement. The diameters of the others are: 60, 70, 80 (2), 90, 120 (2) and 140mm. Mindful of the scale of the excavations, one might have expected more to have been discovered. Bungs like this were certainly used to seal Haltern 70 and Dressel 20 amphoras (Colls et al. 1977, 38-40); to judge by the fabric, others may have been used for Gaulish amphoras (Green 1980, 42). Pre-Roman contexts with Dressel 1 amphoras at Elms Farm always also have grog-tempered wheel-thrown Late Iron Age pottery of Aylesford-Swarling type. Sometimes the same contexts have sand-tempered pottery of Middle Iron Age type, but only as a minor element. The earliest brooch regularly associated with grog-tempered pottery in graves in Britain is the Knotenfibel, which made its debut c. 70/60 BC (Fitzpatrick 1997a, 96, 203-4) and that provides a start date for grog-tempered pottery in eastern England. But ceramic assemblages from settlement sites such as Heybridge itself (as opposed to those in graves) show that grog-tempered pottery did not fully displace earlier styles of pottery until later, in the last decades BC. It was known, therefore, that Dressel 1 made its appearance late in the 1st century BC at Elms Farm, but quite how late came as a surprise. The clarity of the situation at Elms Farm leaves us in no doubt that there was a major shift in the wine trade in Dressel 1, away from the coast of central southern Britain to the south-east at some stage in the later 1st century BC (Peacock 1971, 173-8; 1984, 37-9). At Hengistbury Head it was impossible to tell if the many Dressel 1 amphoras there represented a trickle of wine over a century or more, or a more concentrated trade within a shorter period (Williams 1989b, 144-5). As we have seen, the question can be answered for Heybridge; the Dressel 1 amphoras represent a brief period of importation, on a scale, moreover, rarely found in Britain. What is all the more remarkable is that the numbers of Dressel 1 reaching Gaul were in marked decline from at least c. 40 BC (Tchernia 1986, 140). This makes the Elms Farm phenomenon distinctly anomalous, and the topic is explored below. Several Late Iron Age pyre-related features included amphora sherds; only one amphora was present in each feature. Pyre-related feature 2195 (Group 317) contained a single neck sherd from a Dressel 1 or 2-4 amphora. The surface is cracked and crazed to give it a thoroughly desiccated appearance. What is normally a red fabric has here been burnt to a scorched light grey. Pyre flue 2201 (Group 316) produced thirty-four Dressel 1 sherds, comprising handle, body and neck with shoulder sherds. Identification of the form as Dressel 1 is clear from the straight handle with oval section, made up in part of joining sherds with breaks made in antiquity. Pyre site 2490 (Group 316) produced forty-six Dressel 2-4 sherds, all from the same vessel. Sherds from a handle, the body and neck are present. With one exception, the bifid (figure-of-eight) handle sherds have separated into their component rods. Pyre flue 2908 (Group 316) produced fifty sherds from a Catalan Dressel 2-4. All of the small sherds are cracked and crazed; very little of the original surface survives. The normal red of these Catalan sherds has been burnt a light brown. Only the large white inclusions and golden mica flecks allowed the identification of the fabric. A grooved handle sherd settled the identification as Dressel 2-4. In contrast, pit 15417 (Group 33) produced a significant quantity of amphora sherds, representing a minimum of three Dressel 1 amphoras (Figure 302, nos 24-7). None of the sherds is abraded (even the smallest) and the number of joining sherds shows we are not dealing with old and redeposited material. These amphoras were buried not long after breakage. The condition of the amphora sherds is much altered from their original state. Their fabric normally has abundant red pellets, but the sherds have lost these inclusions from their outer surfaces to give sherds a pitted and vesicular appearance. The impression is one of amphoras damaged through thermal shock that has led to differential expansion of inclusions and a resultant weakening of the surfaces. Indeed, a few sherds have dark grey blotches that look like scorch marks. Many of the body sherds are rectangular or cuboid blocks of varying size, suggestive of heat fracture and quite unlike the irregular outlines normally encountered. The condition of the sherds from all five features can best be explained by exposure to intense heat, in this case from funeral pyres. Not only have the sherds been damaged by heat, they have all subsequently (or simultaneously) been broken into small sherds with a mean weight that is lower than for the general amphora assemblage (69g). When amphoras were placed in Late Iron Age and Early Roman cremation graves in Britain they were often intact, but always without their bungs (showing the contents had been consumed and the pots themselves placed in the grave empty). This is standard in classic 1st century BC Welwyn-type burials such as that at Welwyn Garden City, Hertfordshire (Stead 1967, 7-8). A less common rite is burial in the grave of portions of amphora, or even simply one or more sherds. The practice has only been reported from the c. AD 1-60 King Harry Lane cemetery at Verulamium (Stead and Rigby 1989, graves 117, 206, 241, 272 and 447; Williams 1989a). Another rite is the inclusion of sherds from smashed amphoras in the elite burials at the Lexden tumulus (Foster 1986a, 170; Williams 1986) and Stanway in Colchester, and at the Folly Lane burial at Verulamium (Williams 1999). No other assemblages of burnt amphoras have yet been identified in Iron Age Britain that are at all similar to those from these pyre-related features. One needs to look to the European mainland for comparanda. At the rich c. 80-60 BC grave at Clemency, Luxembourg, the thirty to forty Dressel 1 amphoras involved in the funeral included vessels that had been incorporated in the pyre. Sherds from the same amphora could be burnt and unburnt, suggesting the amphoras had been leant upright against the pyre. After the pyre had burnt itself out, the amphoras were smashed and the sherds spread across the ground in a pavement-like structure, the pavé d'amphores. None of the ten Dressel 1 from the funerary chamber itself had been burnt (Metzler et al. 1991, 40, 46, 78-9). It is interesting to note that the mean sherd weight of the broken Dressel 1 amphoras from the pavé d'amphores was lower than that of amphoras from settlement contexts at the nearby Titelberg oppidum. Renewed excavations at the nearby cemetery of Goeblingen-Nospelt in 1993 have uncovered similar pyre debris and another pavé d'amphores (Metzler-Zens et al. 1999, 403). In addition, further light has been shed on burnt amphoras in a funerary context from Lamadelaine, a 1st century BC cemetery next to the Titelberg oppidum and not far from Clemency and Goeblingen-Nospelt (Metzler-Zens et al. 1999). All three sites lie within 20km of each other, in the central Moselle homeland of the Treveri. The rites described above have not been reported elsewhere in Gaul and it is here - among the Treveri - that the practice of placing amphoras on funeral pyres developed. It is found among them as early as the first half of the 1st century BC, and, under Augustus, this new component of funerary ritual seems to have reached Heybridge to give us an insight into links between a community in Britain and a specific canton of Gaul. The seven amphoras from the pyre-related features are a significant proportion of those from the Late Iron Age settlement. Their incorporation in funerary pyres shows that wine was consumed at Heybridge and a powerful hint as to how wine was actually consumed in Iron Age Britain is provided by the associated material in pit 15417. Although no animal bones survived, the presence of an imported mortarium, a Pompeian-red ware cooking dish, a Central Gaulish flagon, as well as a wealth of imported and locally copied platter and beaker forms (see KPG5) show that we are dealing with the preparation and serving of food and drink. The linkage with feasting shows that wine was drunk in the Roman style, at a banquet or dinner. The same picture emerges from rich graves in south-eastern Britain with their wine amphoras, silver cups, fire-dogs, cauldrons and suites of imported table crockery. Greek practices were quite different; among them, the drinking party or symposium took place after the meal (Dunbabin 1993, 129, fn.65, 140). This need not have been an inadvertent convergence of practice between widely separated cultures, but instead the conscious adoption of Roman mores by Britons with access to the fruits of Mediterranean civilisation. The assemblage of Dressel 1 amphoras from Elms Farm is remarkable, not just for its size but for its late date. Dwindling exports of Dressel 1 to Gaul from at least as early as c. 40 BC demand special circumstances to account for a group of such size, so late and at the very northern limits of the distribution of the form. Developments in Gaul and the Rhineland under Augustus hold the answer (Cunliffe 1984a, 4-16; Fulford 1991, 36, pace Millett 1990, 33). Preparations and planning for the Roman attack on Free Germany across the Rhine in 12 BC may have been underway at least a decade earlier (Wells 1972, 95). The concentration of such an army imposed considerable strain on the resources of Gallia Belgica and the Rhineland. Supplying the frontier armies remained a taxing logistical problem until the agrarian regimes of Belgic Gaul and the Rhineland had adjusted themselves to the demand (Roymans 1996, 58-88). The scale of the problem can be gauged from the 8,400 to 21,000 tonnes of cereals it has been estimated the lower Rhine army consumed under Tiberius each year (Roymans 1996, 59). Demand for leather by the army was such that after 12 BC, the Frisii beyond the Rhine were required to pay their annual tribute in hides (Tacitus Annals 4.72). So monumental was the effort to provision Germanicus for his campaign across the Rhine in AD 15 that Italy and the western provinces offered arms, horses and gold (Tacitus Annals 1.71). But a year later Germanicus found that the supply of horses from Gaul was exhausted (Tacitus Annals 2.5). Clearly the economic burden of these great armies was immense and became a new and powerful factor in economic realignments in Gaul, the Rhineland and further afield. The Roman army raised supplies as and where it could, even from beyond the frontiers. This may account for the punitive measures taken by M. Vinicius in 25 BC against Germans who had massacred Roman traders beyond the frontiers (Dio Cassius 53.26.4). The celebrated list of British exports in Strabo (4.5.2) includes agricultural produce: grain, livestock and hides, as well as raw material such as iron. The foreign cereals that may have reached Silchester, Hampshire, in the Late Iron Age from the Mediterranean need not impugn confidence in Strabo (Fulford and Timby 2000, 551). With the notable exceptions of the city of Rome and classical Athens, it was exceptional in antiquity for staple foodstuffs to be transported long distances to feed settlements on a regular basis. Most communities fed themselves; when they could not, they ran the risk of starving to death. Some of the exports listed by Strabo show that Britain had found herself drawn into the network of economic relations that led to the Roman garrisons across the channel. The rise to prominence of Heybridge under Augustus was therefore perhaps linked in some way to the supply of British produce overseas to supply the Roman army; behind the archaeology of Late Iron Age Elms Farm lies the hand of the Roman state. This major pre-Roman settlement at Heybridge was not the culmination of a site with a long history, it was a new foundation whose prosperity is explicable only by reference to specific circumstances in a wider geopolitical scene. Whether or not this special status had a diplomatic dimension is another matter. In 54 BC the Trinovantes of Essex became the clients of Caesar after they successfully appealed to him to save their kingdom and prince, Mandubracius, from continued aggression at the hands of the neighbouring warlord, Cassivellaunus (Caesar De Bello Gallico 5.20-22). Peacock (1971, 175-8; 1984, 39, endorsed by Williams 1989b, 145) suggested the Dressel 1 amphoras in eastern counties were directly connected with this treaty relationship between the Trinovantes and Rome. Elms Farm invites further consideration of this. A word of caution should be sounded at the outset about simple equations between wine amphoras and political affiliations. The coins of Vercingetorix depict a wine amphora, but this was the man who led the great revolt against Caesar in 52 BC (Allen 1980, 75, pl. 15, no. 203). In Picardy, Dressel 1 was common among the Remi and the Suessiones before the Gallic Wars, yet the two states took quite different postures at the start of the conflict that followed. Italian wine reached Belgic Gaul through many intermediaries and those who drank it before the war may have had only the haziest conceptions (or none at all) of Italy and the Roman state (Haselgrove 1996, 174). On the Peacock view (1971, 175-8) the treaty arrangements between Caesar and the Trinovantes in 54 BC coincided with a drastic attenuation of wine imports to Hengistbury Head and neighbouring sites in central southern Britain after the revolt of the Veneti. Peacock (1984, 37-9) himself was the first to realise that developments in Dressel 1 chronology since 1971 made this articulation of the amphoras with the Gallic Wars untenable. Nevertheless the view persists that the middle of the 1st century BC saw a shift in the wine trade away from Hengistbury Head in particular, and the Dorset-Hampshire region in general, to south-eastern England, and that the Gallic Wars were the catalyst for this change (Millett 1990, 31; Cunliffe 1991, 438-9; Tyers 1996, 50-1). A drastic reassessment of the chronology of the Hengistbury Head amphoras is long overdue. A comparison with an important group of Dressel 1 amphoras dated c. 125-100 BC from a cellar at Mont Beuvray (Olmer et al. 1995) shows that many of the Hengistbury Head amphoras have typological features that are earlier still. Wine imports at Hengistbury started not in the 1st century BC but much earlier, in the previous century. The main period of importation in Dressel 1 there had ended early in the 1st century BC, long before the Gallic Wars. The change from Dressel 1a to 1b took place well before the mid-1st century BC, and so the Dressel 1 amphoras found in Kent, Essex, Hertfordshire and neighbouring counties cannot be taken to be exclusively post-Caesarian. Any lingering doubts that wine was reaching the south-east before Caesar have been dispelled by finds such as the Baldock Dressel 1 (Stead and Rigby 1986, 53, fig. 21, no. 1) and by an assemblage of typologically early Dressel 1 rims from Stansted airport (Williams 2004, fig. 114, nos 1-4). The Peacock thesis that the Dressel 1 amphoras in Essex and neighbouring counties are a tangible expression of the 54 BC treaty arrangements - and that wine did not reach the south-east until then - has to be abandoned. Nevertheless, the distribution of Dressel 1 in the south-east does give an insight into political geography because it lends a sharper focus to the divide between the Iceni and the Trinovantes. As one moves north from Essex into East Anglia, Dressel 1 is rare. There were sherds from at least two vessels at Burgh, Suffolk (Martin 1988, 37) and one more from Stonea, Cambridgeshire, in the Fens (Jackson and Potter 1996, 43). Otherwise the form is never found on Icenian sites. Two vessels from south Cambridgeshire lie in marginal territory and one of them might even be a modern antiquarian import (Peacock 1971, 183 citing Fox 1923, 101; Hill et al. 1999, 265). The distribution map does not suggest a gradual reduction in wine imports as one moves north away from the lower Thames and Essex into East Anglia. Indeed the presence or absence of 'early amphorae' has been used to help locate the border between the Trinovantes and Iceni (Martin 1988, 68, fig. 61). Evidently the Iceni closed their doors to Italian wine (and indeed other imports) in the Late Iron Age, a policy to which they resolutely adhered until AD 43 (Sealey 1979, 172-4). Essex was the heartland of the Trinovantes and the weight of evidence for the wine trade in south-eastern England comes from that county. Even across the Thames in Kent, Dressel 1 amphoras are noticeably less common (Hull and Hawkes 1987, 202). Pollard (1991) lists only seven sites, all in the east of the county, but with the major settlement at Canterbury producing a dozen or so. Distribution maps reveal the striking concentration among the Trinovantes, with an extension westward into what was (or became) Catuvellaunian territory (Fitzpatrick 1985, fig. 4). More Dressel 1 amphoras have been found in Essex than in any other English county. To the forty-seven from Heybridge can be added fifty or so from the Sheepen site at Colchester (Hawkes and Hull 1947, 251, form 181; Sealey 1985, 21, 104); there are now some thirty sites in Essex with Dressel 1 amphoras. Heybridge conforms to a pattern found in Gaul, where sites prolific in Dressel 1 are found in regions where the form is common on neighbouring settlements, but in lesser quantities (Woolf 1993, 216). This concentration of Dressel 1 in Essex also contrasts sharply with Gallia Belgica, where the form remains uncommon in northern regions outside the territories of the Suessiones, Treveri, Remi and Meldi (Metzler et al. 1991, fig. 111). The density of sites in Essex with Dressel 1 (but not the number of amphoras retrieved) is thus only exceeded in Belgic Gaul by the concentrations in the Aisne valley and the central Moselle (Haselgrove 1996, 169). The distribution of Dressel 1 in temperate Europe is not simply a function of distance from the source regions in Italy (Woolf 1993, 216). The differential levels of research and recording dwelt on by Fitzpatrick (1987) cannot account for such variations, at least in Britain. Although we cannot invoke a diplomatic relationship with Rome to account for the start of wine imports among the Trinovantes, the many sites with the form in Essex (compared to other regions) - on the very edge of the northern distribution of the form - do hint at a rapprochement - direct or indirect - with the Roman world under Augustus. Much lies hidden in the tantalising references to diplomatic relationships between Britons and Rome under Augustus and Tiberius (Res Gestae 32; Strabo 4.5.3; Dio Cassius 53.22.2 and 5; Tacitus Annals 2.24). We may raise here the possibility that at least some of the Dressel 1 at Elms Farm arrived not as items of exchange, but, instead, for the use of a community of expatriate traders from the Roman world. Dannell (1979, 178) suggested this in connection with the number of early Dressel 1 amphoras in central southern Britain. Roman merchants were certainly prepared to brave the perils of residence in foreign parts. So much is clear for the Gaul described by Caesar (De Bello Gallico 7.3). Their presence at the Braughing complex, Hertfordshire, is evident from the distinctive archaeology of the site (Trow 1988, 158-9), not least the remarkable Graecus graffito (Partridge 1982). The alphabet and language is Latin but the word means Greek [man] or simply Greek (adjective). It is difficult to avoid the feeling that merchant venturers from the Roman world lie behind this and the other graffiti from pre-conquest Skeleton Green and Braughing. Such expatriates would not only have enjoyed wine themselves but would have known how to put it to good use among the Britons. For a later period the artful trader of the Periplus Maris Erythraei recommends wine as a present for an Indian king; elsewhere he describes its role in befriending the natives of east Africa (Periplus Maris Erythraei 17; 49). The whole topic of Roman wine in temperate free Europe could benefit from looking at the parallels to be drawn with the uses and abuses of alcohol by European settlers in north America in their dealings with native Americans (Brogan 1990, 51, 59, 612). The nasty incidents described by Brogan are not a far cry from remarks by Tacitus (Germania 23) or the low conduct of M. Licinius Crassus in 29 BC, who wiped out the Bastarnae after getting their envoys drunk (Dio Cassius 51.24.2-4). Perhaps, too, at Heybridge there was a darker side to our wine amphoras; some of them may have had more to do with the manipulation of natives than with hospitality and feasting. In the Iron Age, Heybridge imported amphora-borne commodities on an exceptional scale for a site in Britain. As noted above, the forty-four Dressel 1 amphoras from Elms Farm are the largest assemblage excavated in Britain since 1945. Wine also reached Elms Farm in Dressel 2-4 and Pascual 1 amphoras. Salazones arrived in Beltrán 1, and olive oil in Dressel 20 amphoras. After the Roman invasion the picture changed, and quickly. Some of the more common forms current in early Roman contexts from the province are lacking. There are no Rhodian amphoras of form Cam 184 or carrot-shaped jars of form Cam 189. Nor is there any sign of the less common amphora types such as London 555 or Richborough 527. Indeed the only new arrivals are a few Gaulish vessels and - in late antiquity - Kapitän 2. The former is represented by a minimum of only nine vessels and the Kapitän 2 by a solitary vessel from a late 4th century context. After AD 43, the only amphora type present in quantity is the ubiquitous Dressel 20, which dominates the scene almost to the exclusion of other types. The decline in the fortunes of Heybridge took place early in the Roman period, at least as assessed from the perspective of the amphoras. This is because, where the identity of the salazon amphoras can be established, the form is always the early Beltrán 1. The hook-rimmed successor form Beltrán 2a (so common in Britain) is nowhere to be seen. In terms of absolute chronology, this means that the settlement was failing to maintain its position as a major consumer of Mediterranean amphora-borne commodities at least as early as c. AD 75. It was suggested earlier that the floruit of Heybridge can be linked to the export of British produce to the mainland of Europe. The ultimate destination of many of these exports may have been the Roman armies based in Gallia Belgica, Free Germany or the Rhineland, at a time when the local economies were struggling to support this new imposition. Eventually the agrarian regimes of Belgic Gaul adjusted to the challenge. When they did, the need for the army to draw supplies from Britain receded. The Roman invasion of Britain may have been the final factor in the disruption of the trade patterns that had brought Heybridge its brief but startling success. Another major Late Iron Age settlement with international connections in the south-east that suffered a similar slide in its fortunes in the 1st century AD was Braughing, Hertfordshire. There, decline had set in by c. AD 25 (Haselgrove 1988b, 27). Its history may have been bound up with the same economic currents that at first sustained, and then deserted Heybridge. This is a convenient point to discuss the status of Heybridge as a port of entry for imported goods, with particular reference to Dressel 1 from Elms Farm. All three of the sites in Britain that have produced Dressel 1 in greatest numbers - Hengistbury Head, Heybridge and Sheepen at Colchester - lie on the coast, or (in the case of Sheepen) on a river only a few kilometres within reach of tidal waters. Occupation at Sheepen did not get underway until some fifteen years after the terminal date of the form. The Dressel 1 amphoras were old vessels that had survived through secondary use after their contents had been decanted (Sealey 1985, 101-8). The site cannot therefore tell us anything about where these amphoras had entered the country. But it is more understandable that Hengistbury Head and Heybridge should be thought of as ports. A survey of Iron Age settlements along the Blackwater estuary in the vicinity of Heybridge shows an extensive network of sites with Roman imports, including amphoras (Wallace 1998). A port need leave no archaeological trace of the commodities or containers that pass through it: amphoras are unloaded from a hold and move inland on wagons or pack animals or up waterways on river craft. The number of Dressel 1 amphoras from Heybridge and Hengistbury is far in excess of anything found on neighbouring sites inland and this must call into question their supposed role as ports or entrepôts for wine. The difficulty could be surmounted by postulating the transfer of wine from pottery jar to perishable container (barrel or leather bottle) for transport inland, but the presence of Dressel 1 far inland shows this did not happen. As in Gaul (Woolf 1993, 216), sites in Britain that are prolific in Dressel 1 cannot be accounted for as places from which wine was redistributed in different containers. Moreover, at Elms Farm a distribution map of Dressel 1 shows no major concentrations of sherds towards the Rivers Blackwater and Chelmer where this activity might have taken place. The archaeology of Dressel 1 and other pre-conquest wine amphoras shows instead how wine had woven its way into the fabric of the community there. The seven wine amphoras (four of which are Dressel 1) from pyre-related features form a significant proportion of those from the Late Iron Age settlement. Their incorporation in pyre-related features shows that wine was consumed at Heybridge and not simply imported in order to be moved inland. Although there were great ports in antiquity with hinterlands, such as Alexandria or Ostia, the relative costs of land, inland waterway and sea transport before the advent of railways encouraged the use of water transport wherever possible (Duncan Jones 1982, 366-9). For a county like Essex, with its deep estuaries and correspondingly long coastline (Allen and Sturdy 1980, 1), it is anachronistic to think that the cross-channel prehistoric wine trade was organised around the distribution of goods from a restricted number of ports. Instead craft with the flat keels of the kind portrayed on bronze coins of Cunobelinus (Muckleroy et al. 1978; McGrail 1990, 43-5) would have taken every advantage of the shallow waters of the indented Essex coast to unload and receive cargoes at will. Even in the Late Roman period the distribution of African amphoras in Britain shows a markedly riverine and coastal distribution (Williams and Carreras Monfort 1995, 238-9). The same picture emerges from Armorica where most of the Dressel 1 amphoras come from on or near the coast (Galliou 1982, 18-19; 1984, fig. 10). Although a case can be made for Heybridge having played a part in the export of British produce overseas to the Roman world, the presence of wine amphoras in quantity there does not - paradoxically - mean that one should see Heybridge as a port of entry for Italian and provincial wine that was then moved inland for consumption elsewhere.